A tasty sweet skinless longganisa made from ground pork, spices and condiments. 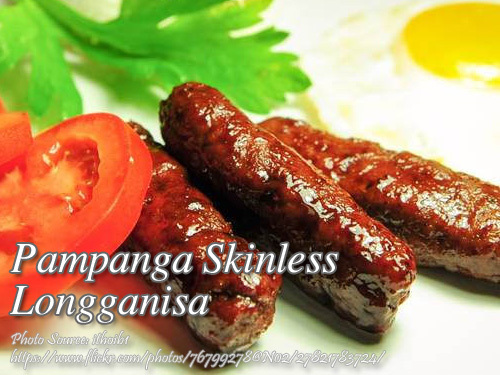 It is a Pampanga style longganisa because of its very sweet taste compared to other longganisa on other regions. It’s because most Kapampangan have a sweet tooth so even making cured meat like longganisa and tocino, the amount of sugar content is generous. In making this longganisa, you don’t need to use hog casings which will simplify the process of making this delicacy. Hog casing are not always available in wet market or supermarkets and the last resort is to make one yourself which I think is a laborious task and messy specially in cleaning the pigs intestines. Stuffing the hog casing with the meat mixture is also a hassle if you don’t have a sausage stuffer. In making skinless longganisa, you only need wax paper or just your bare hands in shaping the logs or patties whichever you prefer. If you are going to ground your pork, remove the skin and leave the fatty layer. Grind the pork finely using a meat grinder or food processor. To make the achuete oil, soak 2 Tbsp. achuete seeds in 2 Tbsp. cooking oil for an hour. Remove the seeds and set aside the achuete oil. In a mixing bowl combine pork, vinegar, garlic, sugar, pepper, salt and achuete oil. Mix all the ingredients until well combined. Chill the mixture for at least 5 hours or overnight. Form the meat mixture into logs about and inch in diameter and 3 to 4 inches long. You can use wax paper to make the logs and cut it about 6 inches by 4 inches. Form the mixture into logs and roll in wax paper. Put longganisa in a baking sheet and put in a freezer until frozen. Transfer to plastic bags or plastic containers and put back in the freezer for storing. To cook the longganisa, you can fry it directly in cooking oil in low heat until brown to prevent burning the longganisa and still raw inside. You can also put some water in the pan and boil the longganisa until the liquid evaporates. Then put some cooking oil and fry it until cooked. Hello! What do you mean by washed sugar? Do we need to add meat tenderizer? Hi Jhun, no need to add meat tenderizer because you are already using ground meat. If you are making tocino or tapa, you may add meat trenderizer. But you can use sodium phosphate to make the longanisa juicy.